There are so many things to do in the Orlando area that we couldn't possibly list them all here. From Disney World, Epcot Center and Sea World to the Universal Orlando Resort, there's just a ton of things to do and see. And, on the way, you'll travel through amazingly beautiful country. You might even catch some remaining fall colors! If a trip to any of these great Florida destinations is in your plans in the near future, have we got an offer for you! 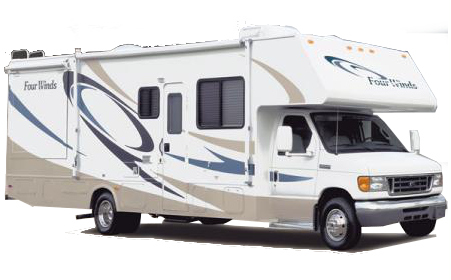 Rent a C25 or C28 motorhome from our Linden, NJ office on or after October 20, 2013, and return to our Orlando, FL office no later than January 20, 2014 and receive $45 off the nightly rate for the first 10 nights, no one-way fee, plus 1200 free miles (additional miles extra)! This is a limited time offer and may be discontinued at any time, so book now to take advantage of this offer! Additional mile packages, Personal kits, Kitchen kits & tax are not included. 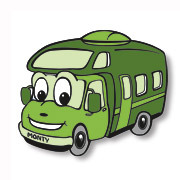 Book NOW to reserve your motorhome! Please call our Reservations department at 800-337-2157 and speak to a Reservations Specialist. Please refer to code FRDS to take advantage of this special! Congratulations to our Facebook Photo Contest Winners! Our Facebook photo contest has ended. Congratulations to Jon Hamilton and Michael Zorek! They both won 3-day motorhome vacation trips from El Monte RV! Stay tuned for the next contest, and Good Luck! The 2013 NASCAR Racing Season is winding down! If you love NASCAR, make sure you make plans now for these upcoming races in October. Throw a Tailgating Party in an El Monte RV motorhome and watch your favorite drivers battle for the finish line! The Chase for the Sprint Cup race at the Kansas Speedway on October 5 - 6! The Good Sam Roadside Assistance 500 Sprint Series race at the Talladega Superspeedway on October 7! The Bank of America 500 race at the Charlotte Motor Speedway on October 11 - 12! The Goody's 500 Sprint Series race at the Martinsville Speedway on October 27! The AAA Texas 500 race at the Texas Motor Speedway on October 31 - November 3! Tuzigoot National Monument holds a fascinating history of the Sinagua people that lived here between 1125 to 1400 CE. This multi-story stone mason pueblo has 110 rooms, and is the largest and best-preserved of the Sinagua pueblo ruins in the Verde Valley. President Franklin D. Roosevelt designated the Ruins as a National Monument on July 25, 1939. There is a self-guided, 1/3-mile loop trail that leads you around and through the 110 room pueblo, and also provides great views of the Verde River and Tavasci Marsh. Another 1/2 mile round trip trail takes you to an overlook of Tavasci Marsh. Hours to the park are 8am to 5pm year round, but closed on Christmas Day. Be sure to visit nearby Peck's Lake and enjoy the hiking and fishing opportunities there! While there are no campgrounds in the monument, there are several nearby campgrounds from which to choose. We have an RV rental location in Phoenix, AZ that makes the 73 mile drive to this national monument easy. However, if starting your trip from another location is more convenient, we also have many other rental offices, so please visit our locations map to find a location that may be more suitable. RV Tailgating Idea: Football Season is here! Hey all you football fans, football season is here! 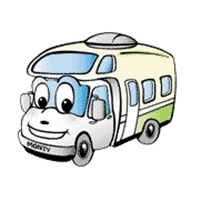 Don't wait another minute to make your plans to reserve your motorhome! Plan that rockin' tailgate party you and your friends will remember for a long time. 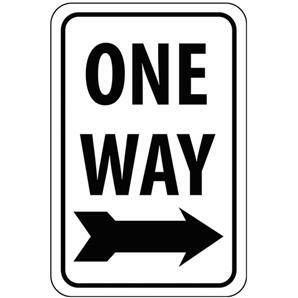 We make it easy with nationwide locations and a wide variety of motorhomes from which to choose. For a more comprehensive list of games, please visit our page on college football games. Please check out our page on professional football games for more game information. ~ Grease and flour two 8 x 4 inch pans. Preheat oven to 325 degrees F (165 degrees C). ~ Sift flour, salt, baking powder, soda, and cinnamon together in a bowl. ~ Beat eggs, oil, vanilla, and sugar together in a large bowl. ~ Add sifted ingredients to the creamed mixture, and beat well. ~ Stir in zucchini and nuts until well combined. ~ Pour batter into prepared pans. ~ Bake for 40 to 60 minutes, or until toothpick inserted in the center comes out clean. ~ Cool in pan on rack for 20 minutes. ~ Remove bread from pan, and completely cool. This best selling Class C model sleeps six, comes with stove, refrigerator/freezer, microwave, generator and so much more. Looks like new! Includes warranty. 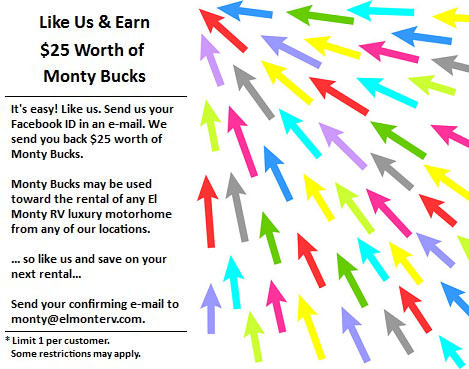 If you're not already a Monty Perks member, sign up at our member portal here. Start adding points now!